Alas the mustard seed. At times I have heard this statement wielded like a weapon by people who report to be people of faith. “The reason that you are not, fill in the blank, cured, successful, married, wealthy, on and on, is that you don’t have enough faith”. I have heard this thrown up by people who do not believe as an example of the ridiculousness of faith: “Move a mountain..really??? You really believe that nonsense?” I will admit that I have used this against myself: “I’m just not believing hard enough is why my prayer is not coming to fruition.” And of course there is that famous scene in Star Wars, where Luke Skywalker can’t move his ship out of the water, but Master Yoda, because he has no doubts, accomplishes the seemingly impossible. So we focus on the mountains. We close our eyes, may get on our knees, we tighten every muscle and we pray, oh how we pray. Sometimes I’m like Dorothy in the wizard of Oz. I’ll just click my heels, say there’s no place like home, over and over, and believe I’m there. Then I’ll slightly open one eye to peek and see if it came true. When things don’t turn out as we had hoped and prayed, we often focus on the mountain: “It was just too big” we say to ourselves. Yet maybe we are focusing on the wrong thing. Let’s consider the mustard seed. It has one God Given Purpose. When it is planted, its mission is to eventually become a mustard tree. God has a uses for the tree, one of which is to be a shelter for birds. The seed can not say, I think I want to be an elm tree, or produce tomatoes. No, its only choice is to become what God has intended. Which brings us then to the mountain. Is the faith that we have being used for what God intended? Why is it that we want the mountain moved? Is it for our convenience, to show our power and glory, for our gain? Often when we contemplate what Jesus meant, we think in terms of size or volume. Our faith is not large enough. If Jesus had wanted to use an illustration where size mattered; why didn’t He use a really large seed for His illustration; like a coconut? So perhaps, just perhaps, it was not about the size at all, but the intent. 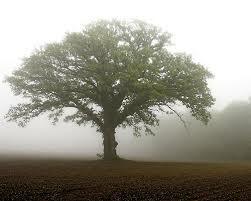 The faith, the intent of the mustard seed, is to do God’s Will and become a mustard tree, it has no other purpose. Indeed the seed is incapable of even devising another purpose. You and I, like the mustard seed, are God’s creation. As the song says, He put me hear for a reason, He has a mission for me. That like the mustard seed, my prayers, my actions, my life are totally devoted to His Will, no mountain can stand in my way. How can I be sure of that? In the beginning, after He created me, He called it very good. His Will is that we and He will be together always. How do I know that? He gave His only begotten Son, that I would believe and not perish. Oh that the Love He has for me, would be the seed, that leads me to be the tree of life, His Will desires me to be. Our Most Gracious and Heavenly Father, how I long to carry out Your Will in my life. Yet I humbly confess, that so often I want more of my will than Thine. I often use my faith and my prayers selfishly in an attempt to gain my own way. I pray for Your Help, Dear Father, to overcome the temptation of the devil, to accomplish only my own desires. Pour out Your Spirit upon me and write Your Name on my heart, that everyday, I will grow stronger in the desire to carry out Your Will in my life and see the fruits and blessings of that relationship. That in the sure knowledge of being on Your Path, my faith will be such that no mountain, or earthly construct will stand in my way in carrying our Your Mission for me. In the name of He who came, lived and died for my salvation, Jesus Christ, I pray . Amen. « Why Do We Need More Than Jesus?